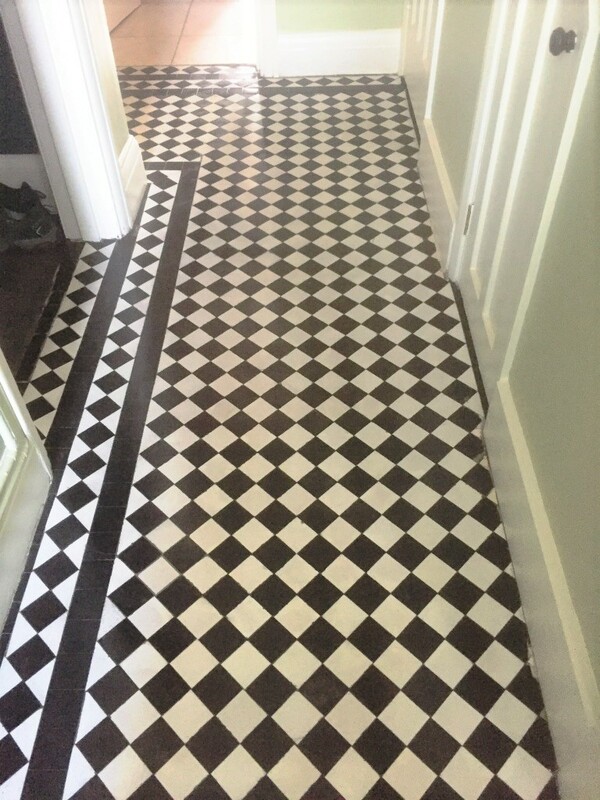 Our client got in touch to see if we could restore the appearance of her Victorian tiled hallway floor. The property was located on the outskirts of Oxford which as I’m sure your aware is a city that is steeped in history and most famous for its’ University, which is the oldest in the English-speaking world. The architecture in the city is magnificent, much of it dating back to Saxon times. When we arrived as you can see from the first picture, this floor had some missing tiles along the righthand edge which had been back filled with some sort of filler. Fortunately, I’ve done a quite few of these restorations before and knew where to source replacements that would match perfectly. It would be great to restore the floor and get the black and white chequers looking as they should. I discussed a plan to fully restore the floor with the client and agreed a price for the work to be done. Our first step in the restoration of the floor was to cut out the filler from the floor and clean out the resulting hole so the replacement tiles could be inserted. We then carefully measured the holes and cut the replacement tiles to match. We then laid the tiles with fast curing tile adhesive, this completed the repair part of the restoration and we left the floor for the day, so the adhesive could set overnight. Day two was phase two of the restoration plan which involved deep cleaning the floor using abrasive burnishing pads. We started with the application of a 100-grit diamond encrusted burnishing pad which was attached to a rotary floor machine and run over the floor with a small amount water to lubricate. The resulting soil was then rinsed off with water and then removed with a wet vacuum. We repeated the process with a whole series of burnishing pads with increasingly finer grades, they included 200, 400, 800 and 1500 grit pads to fully renovate and restore the surface. This process took the whole day and we finished with a 3000-grit pad which gave the floor a slight sheen, this last pad is applied dry with only a little water sprayed onto the tile. This process deep cleans and refines the Victorian tiles to fully restore their appearance. It also has the benefit of using less water than a chemical cleaning process which is a big advantage on these old floors which were laid before the invention of damp proof membranes and excess moisture can result in the appearance of efflorescence salts as the floor dries. The floor was again left overnight to dry out and we returned on the third day to seal the floor. The moisture level of the floor was tested first with a damp meter to ensure it was dry, adding sealer to a damp floor is not recommended as it can result in a patchy finish. All was so the Victorian tiles were sealed with a couple of coats of Tile Doctor Colour Grow. This is a colour enhancing sealer that will enhance the contrast of the black and white chequered effect, it’s also fully breathable so will cope well with any moisture. Colour Grow leaves a matt effect to once it had fully dried the floor was buffed with a 3000-grit diamond pad to add a slight sheen to its appearance as requested by the client. The client was over the moon with the result and really pleased with the repair we had done, the floor looked as it should and they were now able to keep it nice and clean. A warm welcoming hallway now awaited their visitors. 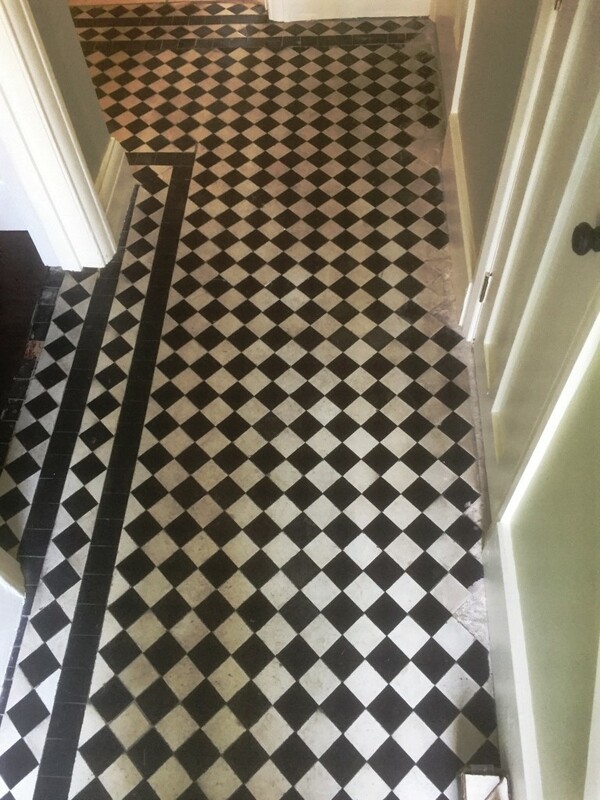 This entry was posted in Black and White Tiles, Burnishing Victorian Tiles, Chequered Victorian Tiles, Hallway Floor Restoration, oxford, oxfordshire, Tile Cleaning Activities, Tile Replacement, tile restoration, Work History by TileProf. Bookmark the permalink.